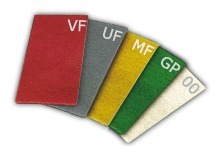 Corazzi Fibre manufactures an extensive range of non woven abrasives suitable for the main industrial processes such as deburring, satin-finishing, surface finishing, polishing of workpieces in a wide variety of materials, for example metal, wood or plastic. These products are likely to be converted into tools such as, for instance, discs, ventilated, flap or convolute wheels and hand pads. The firm owns a peculiar flexibility in the manufacturing of private label products. Our non woven range is compatible with some of the 3M products as, for example: 6444, 6448, 7440, 7441, 7445, 7446, 7447, 7448, 8698, 96, Multiflex; with some of the SIA items as, for example: 4223, 4370, 4396, 4400, 4420, 4440, 4450, 4460, 4470, 4480, 4484, 4600, 4602, 4609, 4610, 4630, 4635, 4636, 4639, 4640, 4790 and with the line Mirlon by MIRKA. Corazzi products are available in jumbo rolls, scuff rolls and pads. The registered trademarks 3M, Multiflex, SIA, MIRKA and Mirlon are the property of their respective owners. Corazzi Fibre has no connection with the above mentioned brands. Corazzi Fibre offers a complete range of products for hand operated processes of finishing and polishing on several types of surfaces, available both in pads and rolls. Corazzi Fibre offers a wide range of fibres in rolls suitable to be converted. These products are sprayed or impregnated with abrasive alluminum oxide and silicum carbide. Corazzi Fibre is the ideal partner for industries reselling abrasive products under their own brand.